It seems to happen out of nowhere: You're sitting on the toilet, minding your own business while doing your business, and all of a sudden you notice various shades of green where you're accustomed to seeing brown. What gives? Are you sick? Did you eat something with radioactive food dye that's poisoning your intestines? Are you dying? You're probably dying. Slow down! It's actually totally normal to have green-shaded turds every now and then. But here's what's going on when your bowel movements are going green, and not in the Al Gore sense. There could be some minor GI malfunctions happening on your waste's journey from stomach to toilet bowl. 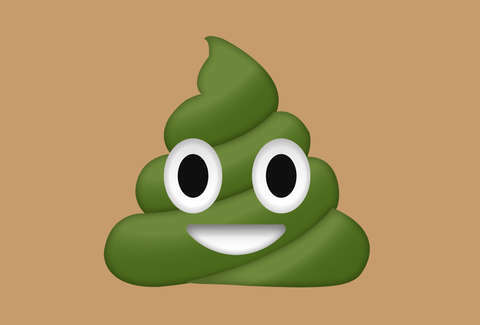 According to Dr. Gina Sam, a gastroenterologist with Mount Sinai in New York City, when poop comes out green, it's usually because it was moving too fast through your digestive system. Your intestine didn't have enough time to break down the bile, which is naturally a yellow or green color, that's secreted from your gallbladder to help break down food. This is also why green poop tends to be more diarrhea-esque, to use a medical term. Now that we've talked about green diarrhea, let's talk food. The high-fat keto diet is gaining traction these days (even if the actual merit is somewhat controversial), and such a high proportion of fat in your system tends to be not so great for your bowel movements. "If you eat a high-fat diet, then you will need more bile to digest these fats," says Dr. Sam. This is another way the bright-colored bile makes its way into your toilet bowl. By now you're aware that a diet rich in leafy greens, especially kale and spinach, is really good for you. The only downside (besides being smug about it to your unhealthy friends), according to Dr. Sam, is that it could turn your poop the same color as your favorite veggies. It takes a lot of kale to make this happen, but between green juices and bottomless kale salads, it's totally doable and not that uncommon. Well, maybe not the throwback juice box, per se, but any food that's dyed a radiant green or purple color could be a culprit. Things like colored icing, artificially dyed beverages, and any other food with bright, unnatural colors could all make their way into your poop, and totally change the typically brown color. Rainbow poop? Sounds like it could be Insta-worthy. (Note: please don't actually do that). No matter what the cause of your green poop is, it's usually not anything alarming. The biggest issue is if it persists; Dr. Sam says that if you keep experiencing green diarrhea, it could be from an infection, and you should see a gastroenterologist. But more often than not, your bowel movements will go back to brown in no time. "Eating a well-balanced diet will help your stool become brown," she advises, and that's reason enough to eat healthy, right? If it really bothers you, maybe lighten up on all the fatty foods, be wary of anything dyed green, and generally steer clear of anything you know will give you the runs (looking at you, dairy). Otherwise, keep enjoying those Shamrock Shakes and consider green poop your body's way of just mixing it up from time to time.